History - Lakeland Pump & Well Co.
Lakeland Pump & Well Co.
Lakeland Pump & Well was started in 1960 by Fred Tomenko (above on left), a former World War II Air Force mechanic who took up well drilling to support his growing family. He ran the business 24 hours a day/7 days a week to meet his customer’s water needs. As the business grew, he wanted a special drill rig that would operate more efficiently, and when he couldn’t find it, he built it himself. 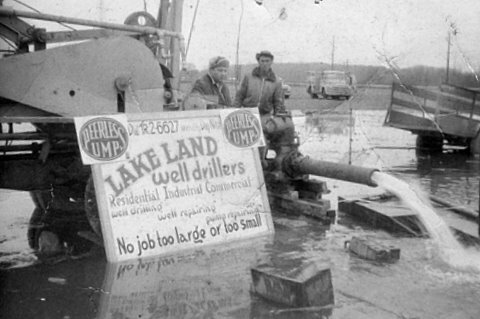 That rig is so unique and useful for drilling in Northern Indiana, that it is still in use today. One of his sons, Patrick, learned the well drilling business at a young age, and took it over when his father retired. It operates in the same original location on Karwick Road in Michigan City. Patrick is proud to have his son, Jason, as the third generation to be involved in the business.